수 업 목 표 21세기 정보사회의 대두와 함께 등장한 정보사회 역기능과 선기능은 이제 사회적인 이슈가 되었다. 이에 본 <정보사회와 윤리>강의에서는 정보사회에서 나타난 윤리적 문제점 분석을 시도한다. 그리고 강의를 통해 정보화의 역기능에 따른 피해를 줄이고, 정보사회를 살아가는 사회구성원으로서 갖추어야 할 바람직한 가치관과 행동양식을 이해함으로써 올바른 정보윤리를 정립시키려는 목적을 가지고 있다. 1 정창덕. 2007. 『유비쿼터스 컴퓨터 인터넷 윤리』. 서울: MJ 미디어. 2 마뉴엘 카스텔 지음. 박행웅 옮김. 2004. 『인터넷 갤럭시』. 파주: 한울. 3 주영주·최성희. 2006. 『클린 인터넷을 위한 정보통신윤리』. 서울: 남두도서. 1 [사이버스페이스에서의 부적절한 행위양식에 관한 연구], 정희태, 고려대 박사논문, 1998. (2) Difference between Korean and English one. Model Q : Where do you see yourself in 5 years ? 구체적인 직위는 언급할 필요가 없으며 해당 분야에서 자신이 기대하는 기회 및 그런 기회 를 통해 배우고 싶은 것들에 대해 언급해야 할 것입니다. 물론 지원 분야와 관련이 없는 언 급은 금물입니다. 인사 담당자가 알고 싶어 하는 것은 지원자가 구체적인 성장 계획과 포부가 있는지를 또한 그 이유를 알고 싶어 합니다. Including getting the right position now. With your skills the place where you want to be in. Opportunity you want to have. I hope to be a manager for a team of developers geared toward new technology for the internet and mobile telecommunications. In five years I see myself being in a position where I can lead the marketing team. By then, I hope to have learned more about overseeing other staff members and complementing needs of customers. I’d like to have the opportunity to work in a plant as well as at the head office. I also hope to develop my management skills, perhaps by managing a small staff. Well, in five years I see myself being in a position where I can be involved in more of the decision making process in the marketing team. I have many innovative marketing ideas and I would like to see more of my fresh ideas being implemented, of course, with my team members’support. In five years from now I’d like to have the opportunity to work in a retail store where I can meet the customers directly as well as serving customers over the telephone and other non face-to-face methods. By then, I hope to have broadened my on-the-job skills, have learned more about other areas that are related to the job, have more supervisory experience in overseeing other staff members, and better understand the needs of customers to service them directly. Model Q : Where do you see yourself in 10 years ? 꼭 지원하는 회사 내에서의 미래일 필요는 없습니다. 향후 10년 동안 자기 개발을 통해 어 떤 능력을 갖추고 무슨 일을 하고 싶은지에 대해 말을 할 수 있으면 됩니다. 내 사업을 하 겠다고 답한다 해도 이 회사에서의 경력이 자신의 사업에 기반이 될 것이니 만큼 그만큼 책 임감 있는 태도로 회사 일을 해 줄만한 인재라는 인상을 줄 수 있을 것입니다. Ten years from now, I will have progressed up the ladder into a respectable management position with responsibility for a major piece of the business. I will have gotten there by proving I am a creative problem solver and someone who can grasp the scope of a whole program while not losing slight of details. Basically, my long-term career is to become known as an industry expert. In ten years, I will have a professional degree in art management and enough marketing expertise, together with strong client connections. With that I would like to lead a team in the company. This way, I believe I can input my unique ideas and flavors of art management in the company’s business. I can see clearly myself being a business woman with more business ideas. I can’t tell you right now what field of business I’ll be in by then. But I know fire sure I’ll be running some kind of business. The second picture that pops up in my mind is a woman in her late 30s who retired from her business and is studying in a law school to become a lawyer. And I know what I want to do in 20 years for sure. I’ll be running a non-profit organization for abandoned children. 자기소개서는 자신의 이야기를 하는 것이지만 남을 이해시키기 위한 글이기도 합니다. 따라서 자신이 좋아하는 소재나 단어, 주관적인 시각과 주장을 피하고 타인도 이해할 수 있 는 선에서 거부감 없는 내용을 다루어야 하고, 또한 뽑히고 보자는 식으로 거짓 정보를 담 거나 과장해서 쓰면 아니 됩니다. 가능한 한 솔직하게 자신을 표현하여야 됩니다. 종종 자기소개서에선 자신의 얘기는 접어두고 특정 사안에 대하여 남들도 다 아는 일반적인 주제를 피력하는 경우가 있습니다. 특히 지원 동기나 인생관 등을 나타내는 부분에서 이런 오류를 범할 때가 많습니다. 자신을 타인에게 소개한다는 전제는 망각하고 사이 길로 흐르 기 때문에 다 읽고 나면 ‘도대체 무슨 얘기를 하는 건지’ 라는 느낌을 받게 되는 경우가 왕 왕 있습니다. 항상 자기소개서의 모든 내용은 자신을 타인에게 소개한 다는 전제로 자신의 독특한 이미지를 나타내 주는 일관된 구성으로 이끌어 나가야 합니다. 면접관들도 인간이므로 굴곡 없이 무미건조하게 쓴 글은 보는 사람을 지루하게 만듭니다. ‘나는 어디서 태어나’로 시작하여 ‘산 넘고 물 건너 여기까지 왔습니다.’ 로 끝나는 히스토 리식 자기소개서는 금물입니다. 자신의 개성과 함께 강력한 인상을 심어 줄 수 있도록 일반 적이거나 평범한 이야기보다는 자신의 뚜렷한 장점 또는 강한 의지를 내보일 수 있는 구체 적인 내용 위주로 작성하여야 합니다. 자기소개서도 일종의 광고이므로 다소 특이하고 눈에 띄는 기술도 필요하지요. 자기소개서의 일정한 양식은 없으므로 제목과 중간 소제목을 다는 것도 무방합니다. (4) 한자나 외래어는 신중하게 사용하십시오. 글에서 한자나 외국어를 써야 하는 상황이 있다면 확실하게 맞는지를 확인한 후 주의를 기 울여 사용합니다. 한자어나 외래어를 사용하면 뜻이 빠르게 전달되고 문장이 고급스러워질 수는 있으나 잘못 사용했을 때는 사용하지 않는 것보다 휠씬 나쁜 결과를 초래하기 때문입 니다. 문장 첫 머리에는 ‘나는…’고 나중에는 ‘저는…’로 하고 ‘..이다’라고 문어체 형식으로 가다 가 ‘…했습니다’라고 바뀌는 자기소개서를 흔히 볼 수 있지요. 어느 쪽을 써도 좋으나 한가 지로 일관된 표현을 유지해야 하며 사람에 대한 호칭이나 종결형 어미, 존칭어 등도 통일해 서 써야 합니다. 그러나, 그렇고, 그러하니, 그래서 등의 접속어나 수식어도 많이 사용하는 것도 읽는 사람 의 이해를 어렵게 만듭니다. 가능한 절제하여 간결하고 명료하고 문장을 만들어야 합니다. 자기 소개서엔 그 사람을 파악할 수 있는 아래와 같은 다각적인 정보가 담겨져 있어야 합니 다. 여기에선 자신에 대한 이미지를 심어주는 것이 중요합니다. ‘저는 화목하고 단란한 평범한 가정에서 주위의 귀여움을 받으며 별다른 어려움 없이 자라 났습니다….’로 평범하게 시작하기 보다는 유년기의 일화나 가족관계에 얽힌 이야기, 고향 환경 등을 배경 삼은 서술이 자신의 이미지 구축에 도움이 됩니다, 만일 성장 과정에 어려 움이 있었다면 솔직하게 밝히면서 그 어려움을 극복한 과정이나 본인에게 미친 영향을 설명 하면 좋은 인상을 줄 수 있을 것입니다. (2) 성격 및 생활 태도 ……..
적극적, 긍정적, 명랑, 활발 등과 같이 생활기록부의 담임 의견란처럼 추상적이고 천편일률 적인 단어는 신뢰성이 없습니다. 자신의 성격을 언급할 때는 교우 관계, 가족 관계 등에서 뽑아내어 집약적이고 구체 적인 표현을 해주는 것이 참신해 보입니다. 단점이 있을 때는 무 조건 안 쓰는 것보다 개선의 의지를 곁들어 표현하는 것도 솔직하고 발전적인 이미지를 심 어줄 수 있어 좋습니다. 학창 생활 부분을 설명 할 땐 “대학 시절 위주”로 쓰며, 그 이전 초등학교 때 반장을 했다 는 식의 학창 생활은 생략해도 좋습니다. 전공이나 관심을 두고 활동했던 분야를 지원 업종 과 연관 시켜 풀어가는 것이 중요한데 기업의 입장에서는 가장 관심을 두는 분야 중 하나이 기 때문입니다. 그 밖에도 대학 생활은 학업 외에 그 사람의 인생관과 세계관이 확립되는 기간이기도 합니다. 따라서 자신이 사회를 위해 무엇을 할 것인지 등에 대한 가치관 등을 언급하면 그 사람을 깊이 이해할 수 있는 계기로 작용할 수 있고 강하게 어필이 되는 요소 가 됩니다. (4) 지원 동기 및 각오 ……..
자기소개서에서 빠져서는 안 될 부분, 그 회사에 대해 자신이 얼마나 애착을 갖고 있는지를 내보일 기회가 되며 자신이 그 회사에 꼭 필요한 인물이라는 것을 알릴 수 있는 계기가 됩 니다. 이를 위해서는 신문이나 기타 자료를 통해 해당 기업에 대해 어느 정도 연구를 해두 어야 합니다. 또한 회사에 입사하면 목표 성취와 자기 개발을 위해 어떠한 계획이나 각오를 가지고 있는지에 대해 열정적으로 써야 합니다. 열정이 담겨있는 자기소개서는 읽는 이를 감동시키게 되어 항상 기억에 남도록 진한 여운을 주게 됩니다. I would like to apply for the position of Assistant Marketing Manager at Athletic Gear. I will graduate in May from Kyung Hee University with a B.A. in Psychology. I feel that my education has helped me develop an understanding of human behavior as well as good problem-solving skills. Researching this position, I have discovered that you are looking for someone who has proven ability to work as a member of a team, can solve problems through creative brainstorming, and has a familiarity with the athletic wear industry in general and the needs of customers. I am convinced that I can offer my consistent track record in teamwork, creativity, and my commitment to athletics. 글의 첫 부분에서부터 ‘I would like to apply for the position of Assistant Marketing Manager at Athletic Gear.’라는 문장을 통해 자신이 어느 분야에서 일하고 싶은지를 분명 하게 밝히고 있으며, 마지막 부분에는 ‘I am convinced that I can offer my consistent track record in teamwork, creativity, and my commitment to athletics.’라는 문장을 통해 자신이 업무에 임하는 자세를 분명하게 밝히고 있다는 점에서 지원자의 열정을 엿볼 수 있는 자기 소개서 예문입니다. First of all, I want to say that I am now very pleased to introduced myself of you and your company. My character is cheerful, managerical. In my childhood, I was interested in jazz music and I liked playing the piano. I had taken piano lessons for five years and had decided to be a famous pianist. However entering the middle school, my interest changed from music to studying, especially of English. I had been in high rank of the class the whole my middle and high school days. Therefore, I could pass the entrance Examination of the Kyung Hee University. I entered Kyung Hee University in 2003, my major was English language and Literature. I was a member of AFKN’s Listener’s club, In my fresh man, I participated in Kyung Hee English Drama Club. Mostly the course of my major were very a Academic. So I wanted to study English Language and Literature in addition to my major course. I have been to New York, New York University language course, I had Fluency capacity in spoken and written English and known the concept of communication and public relations skill. I wanted to work in order Administrator position at export professional corporation. Extracurricular, I studied University course pertaining export trade position. I enjoy working, taking in challenges and accepting responsibilities. I heard from many elders that Foreign corporation have good prospects, make contribution to our society in many wage, and tend to pay and treat their employees equally without and discrimination between the sexes. I am one of those woman and I want to go on with my work after marriage. I promise you that I will do my best with responsibility and great pride in my work and your company, if opportunity is given to me. May I come to seel you your convenience to say my new job, Any additional Information you need, I shall be pleased to provide. I can be reached at 02-338-6774 (Telephone contact Number) after six o’clock p.m. any day. 글의 첫 부분에서부터 자기를 원하는 회 사에 적극적으로 알리고 있다는 점이 눈에 뜨입니다. 계속해서 여러 자기 장점들을 피력하 는 모습은 면접관의 시선을 모으기에 충분합니다. 중반부에 ‘I wanted to work in order Administrator position at export professional corporation.‚라는 문장을 통해 자신이 어느 분야에서 일하고 싶은지 분명하게 밝히면서 이 분야에 대한 나름의 대학 활동 ‘Extracurricular, I studied University course pertaining export trade position.’도 돋보이는 대목입니다. ‘I enjoy working, taking in challenges and accepting responsibilities.’를 통해서 역시 지 원자의 열정을 엿볼 수 있는 자기 소개서입니다. ‘I can be reached at 02-338-6774 (Telephone contact Number) after six o’clock p.m. any day.’라고 하면서 연락해 달라는 부분도 남달라 보입니다. 그러나 지원자의 입장이 아 닌 회사의 입장에서 고려해야 한다고 할 때 혹시 마이너스 요인이 될 수 있습니다. 허나 어 찌 보면 좀 당차기까지 합니다. 누군가가 옆에 있던 없던 무슨 일이든지 항상 열심히 그리고 성실히 하라고 가르치시는 부 모님의 1남 1녀 중 장남으로 태어났습니다. 무슨 일이든 노력하면 할 수 있다는 마음가짐 을 가지며 성장하게 되었고, 부모님께서 저를 위해 해 주신 모든 일들에 대해 감사하며 항 상 존경하는 마음으로 살아가고 있습니다. I am the first-born son of my parents a and have a younger sister. They have taught me that I have to work hard and sincerely whether someone watches me or not. I have grown up with an attitude that if I try hard enough. Now I am living with appreciation and respect for my parents for all they have done for me. 한국에서 출발해서 캐나다 가는 동안과 캐나다에서의 생활이 저에게는 아주 특별한 경험이었고, 또 한 번 “하면 된다.”는 말을 실감케 한 계기였습니다. 캐나다를 갈 때 일본과 미국 을 경유해서 갔었는데, 환승 지역에서의 지연 출발 속에서도 무사히 캐나다에 도착했었고, 그 곳에서의 입국 심사도 어설픈 영어로 무사히 통과했었습니다. 캐나다에서의 생활도 아르 바이트를 하면서 생활비와 교육비등 그곳 생활은 모두 제가 모은 돈으로 충당했고, 그것들 중 매달 조금씩 모은 돈으로 한국 오기 전 약 한 달 동안 유럽을 외국 친구들과 갔었습니 다. The time that I flew to Canada and lived there, was my special experience, which made me understand phrase, “I can do it.” While I was going to Canada by plane, which went via Japan and the U.S., I safely arrived in Canada in spite of delayed departure in the transfer station. I entered the country with my poor English without any troubles in the immigration. I lived by myself in Canada, working for my living expenses such as rent, transportation, studying, etc. I went to Europe with friends who were from other countries with the money that I saved while working. “노력 없이는 결실을 맺을 수 없다”” 라는 말과 “고생 끝에 낙이 온다.” 라는 말이 있습니 다. 어려움이 찾아 올 때가 인생에 있어서 더 없이 귀한 시간이고, 이 시기를 잘 헤쳐 나가 야만 비로소 무엇인가를 이룰 수 있습니다. 저는 이제 사회에 첫 발을 내딛는 초년생으로 앞으로 시행착오도 많이 있겠지만, 꾸준히 지치지 않는 노력과 성실함으로써 무슨 일이든 해 나갈 것입니다. 근면하고 성실함으로써 남에게 믿음을 줄 수 있고, 회사에서 없어서는 안 될 존재가 되기 위해 꾸준히 자기 개발을 해 나가겠습니다. There is a proverb, “No sweet without sweat.” Meaning, nothing can be obtained without any effort. It is the valuable time in your life when you are faced with a difficult situation and you have to solve it in order to accomplish your goal. I am going out into the world as a beginner. I will do my job by working hard and making my best effort, learning by trial and error. I will continue to develop myself to be a person who is necessary in your company. 항상 미소를 잃지 않으며 긍정적인 사고로 어두운 면보다는 사물이나 사람의 밝은 면을 보 려고 노력하는 성격입니다. 이러한 저의 성격은 여러 사람들과 함께하는 일에 쉽게 참여할 수 있고, 그 어떤 분위기에서도 빨리 적응하는데 도움을 줄 것입니다. 단점으로는 다른 사 람들은 별로 대수롭게 여기지 않는 것에 대해 가끔씩 신경을 쓰곤 합니다만, 저의 캐나다에 서의 생활이 이러한 성격을 많이 바꾸어서 좀 더 여유로운 생각을 가지게 해 주었고, 지금 은 그런 일에 대해서는 대범하게 처리하려고 노력중입니다. 위의 자기 소개서는 “1. 성장과정 → 2. 주요 경험 → 3. 인생의 목표 → 4. 장점 및 약점” 으로 잘 구성되어 있습니다. 1. “Cover Letter” 란 ? (1) Cover Letter의 역할 커버레터를 자기소개서와 혼동하는 경우가 있는데 커버레터는 주 목적의 서류인 resume (이력서)를 보내면서 이를 보게 하려는 의도에서 자신의 경력과 학력 등의 자격 조건 등을 간단히 피력하기 위해 함께 보내지는 서류입니다. 담당자가 커버레터를 읽고 resume(이력 서)를 “검토해 보아야겠다.”라고 결정하면 커버레터는 그 역할을 다한 셈이 됩니다. b. 편지의 첫 머리에 ① (직책/구인 광고)의 자리에 지원하고자 이 글을 씁니다. I’m writing to apply for 직책. I’m writing in response to 구인 광고. ② (신문/잡지명)에 났던 구인 광고는 다음의 이유로 저의 관심을 끌었습니다. Your advertisement in 신문/잡지명 appealed to me for the following reasons. ③ (회사명)에서 (직책)으로서 일하고 싶음을 말씀드리고 싶습니다. I would like to express my interest for 직책 in 회사명. c. 경력을 말할 때 ① 저는 (직책)에 종사했습니다. I served as 직책. ② 지원하는 직책에 관련된 저의 경험은 (경력 내용)와 같습니다. My relevant experience includes 경력 내용. d. 구체적인 담당 업무를 말할 때 ① 저는 (업무 내용)을 담당했습니다. I was responsible for 업무 내용. I was in charge of 업무 내용. e. 지원하는 회사에 대한 긍정적인 인상 또는 극찬 ① 귀사는 (해당 분야) 업계의 선두 주자입니다. Your company is a leader in 해당 분야 industry. f. 나의 관심 분야 ① (관심 분야)에 진지한 관심을 가지고 있습니다. I am interested in building my career in 관심 분야 field. I have a keen interest in establishing my career in 관심분야 field. g. 입사 의지 표현 ① 귀사와 함께 성장하게 할 수 있는 기회가 주어진다면 영광이겠습니다. The opportunity to grow with your organization would be unparalleled. ② 광고계에 첫발을 들인 이후, 귀사에서 일하는 것이 저의 목표였습니다. Since my introduction to the world of advertising, it has been my goal to work for your company. h. 인터뷰 요청 ① 회사가 편리한 시간에 연락 주시면 인터뷰에 응할 수 있습니다. I will be available for an interview any time at your convenience. ② 만나 뵙고 (회사명)에서 함께 일 할 수 있는 기회에 대해 의논하고 싶습니다. I look forward to discussing opportunities at 회사 이름 with you. i. 연락처 남기기 ① (전화번호/이메일 주소)로 연락하시면 됩니다. I may be reached at 전화 번호 or through email. Please contact me on 전화번호 or email me at 이메일 주소. ② 다음 주 중에 연락해서 편하신 시간에 약속을 잡았으면 합니다. I will call you next week to set up a mutually agreeable time for us to speak. Your advertisement in the Korea Herald appealed to me for two reasons. You plan to open up a new branch of Seattle’s Coffee; I seek the opportunity to manage a newly opened store. I am also interested in building my career in the coffee and tea industry. Therefore, I have decided to submit my resume in application for the position of Store Manager. My relevant experience includes three years as an assistant store manager of Seattle’s Coffee and my current position as store manager of Star Cafe. I look forward to discussing opportunities at Seattle’s Coffee with you. I will call you next week to make sure you have received my resume and to set up a mutually agreeable time for us to seek. 크루즈 님께 코리아 헤럴드에 났던 귀사의 광고는 다음의 두 가지 이유로 저의 주목을 끌었습니다. 귀사 는 시애틀 커피의 지점을 개점하려고 하시는 데 저는 새로 개장하는 매장을 운영할 수 있는 기회를 찾고 있습니다. 저는 또한 차와 커피 사업 분야에서 경력을 쌓고 싶습니다. 이러한 이유로 점장 직에 지원하는 이력서를 제출하기로 결심했습니다. 저의 관련 분야 경력은 다음과 같습니다. 시애틀 커피의 부점장으로 3년간 일했으며 현재는 스타 카페의 점장으로 근무 중입니다. 만나 뵙고 시애틀 커피에서 함께 일 할 수 있는 기회를 의논하고 싶습니다. 제 이력서를 받 으셨는지, 그리고 서로 편리한 시간에 만나 뵐 수 있는 지에 관해 다음 주 중에 전화드리겠 습니다. I would like to express my interest in ACE Advertising and the Account Executive position. After four years at Korea University, where I majored in English and wrote for the college paper. I leapt into the competitive world of advertising at Buy & Sell in Seoul. For the past year I have served a valuable apprenticeship in the advertising industry, working as an assistant account executive on the CJJ account. During my time on the CJJ account, the company’s advertising spending has increased by twenty billion won, and I have progressed from having very little client contact to interesting with the clientside on a regular basis. Since my introduction to the world of advertising, it has been my goal to work for Ace. I would like to discuss the position availability. Thank you for your time spent reading this letter and the enclosed resume. 저는 ACE 광고 회사와 광고 기획직에 관심을 표명하는 바입니다. 영어를 전공하면서 대학 신문에 기고했던 한국 대학에서 4년 동안 수학한 후, 저는 서울에 있는 Buy & Sell이라는 회사에서 경쟁이 치열한 광고계에 첫발을 내딛었습니다. 지난 일 년간은 CJJ회사 상품의 보조 기획자로 일하며 광고계에서 의미 있는 수습기간을 가졌습니 다.
CJJ회사 광고를 위해 일하는 동안 그 회사의 광고비 투자액이 20억 증가했습니다. 또한 고 객을 직접 만나는 일이 드물었던 회사의 관습을 규칙적으로 고객을 찾아가 만나는 패턴으로 서서히 바꾸어 갔습니다. 광고계에 입문한 이후, ACE에서 일하는 것은 저의 목표가 되었습니다. 현재 비어있는 직책 이 있는지의 여부에 대해 꼭 의논하고 싶습니다. 이 편지와 동봉한 이력서를 읽는데 시간을 내 주셔서 감사합니다. Jack Smith informed me that you might be looking for someone to fill the production assistant position for the movie you are filming. I worked with Jack last summer through an internship sponsored by the Miracle Corporation and found work to be very stimulating and well-suited to my talents. He suggested that an excellent first step in my career search would be a discussion with you. 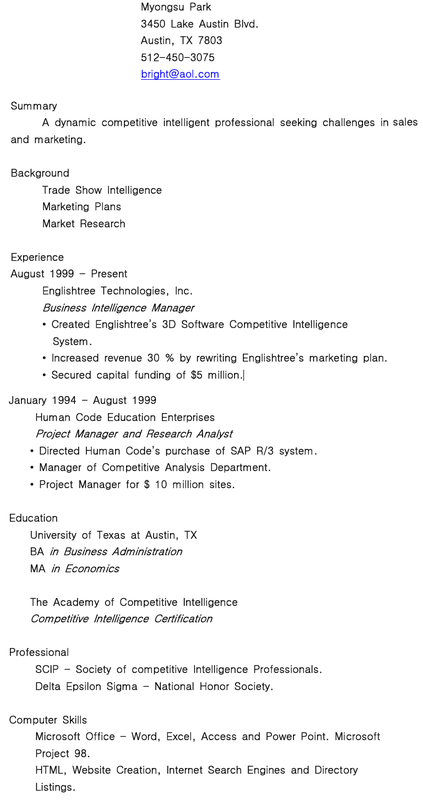 I have enclosed my resume for your interview. I will try to contract you within the week to see if I can schedule an appointment with you. Thank you for your consideration. 잭 스미스 씨께서 귀사가 현재 촬영 중인 영화의 제작 보조직을 맡을 사람을 찾고 있다는 정보를 전해 주었습니다. 저는 지난여름 미라클사에서 후원한 인턴 과정에서 잭과 함께 일 한 바 있습니다. 이를 통해 이 일이 제게 동기 부여를 하며 적성에 맞는 일이라는 것을 알 게 되었습니다. 잭이 제가 직장을 구하려 한다면 맨 먼저 클린턴 씨와 논의해 보는 것이 가 장 좋은 방법일 거라고 제안해 주었습니다. 귀하와의 인터뷰를 위해 저의 이력서를 동봉합니다. 만나 뵐 수 있는 약속 시간을 정할 수 있을지 다음 주 내에 연락드리겠습니다. 3. Cover Letter 작성 시 주의 점. (2) “Realistic & Practical”해야 합니다. – 반드시 알릴 필요가 있는 정보만 넣어 주십시오. – Formal 한 Letter에서는 가급적이면 줄임말을 사용하지 마세요. Dept 는 Department 로 Lang 는 Language 로 Lit 는 Literature 로 하셔야 합니다. (3) 그 외 참고 사항 Resume나 Cover Letter는 비즈니스 공문서에 가깝기 때문에 개인적인 이야기를 쓰면 아 니 됩니다. 개인적인 이야기가 필요한 경우는 어떤 직종의 특수성이 필요할 때 간단하게 설 명이 필요할 뿐이지요. Cover Letter는 Resume를 간단하게 정리하여 소개 하는 것에 불과 하므로 Cover Letter에서 필요한 내용은, ① 정보를 어디서 얻었나. ② 전에 어떤 직장 경 험이 있었나. ③ 자기가 가진 자격(증)이나 경험이 얼마나 직업에 도움을 줄 수 있는가입니 다. Resume, Cover Letter 외에 참고할 것으로 Follow-up Letter가 있습니다. 인터뷰 받고 난 다음에나 아니면 개인적으로 연결이 되었을 때, 다시 한 번 감사의 형식으로 보내는 것 입니다. 감사함과 더불어 자기의 자격이나 능력을 가볍게 강조 하는 것입니다. 따라서 Resume, Cover Letter, Follow-up Letter 이 세 가지는 항상 붙어서 따라다니는 3총사입니다. Cover Letter의 샘플 하나만, 올려보겠습니다. 담당자 이름(예 Ms. Keller, or Mr. Smith) (대개 광고에 보면 담당자 이름이나 직책이 나 와 있습니다. 그걸 참고하여야 합니다. I am interested in the position of Technology Services Technician in Tacoma School District you advertised on Tacoma News Tribune. I am aware that potential offered by employment with a school district recognized for the quality of technical services it provides. My resume outlines the required experience as a technical support with Our Solutions. As you see, my skills, educations and experience closely match your needs. My responsibilities were managing computer installation and troubleshooting, and I work well both independently and in a team environment. I have excellent technical knowledge in a computer field. I look forward to hearing from you soon. 그리고 미국 대학 같은 경우는 인턴 같은 일을 통해 졸업하기 전에 최소한 일 년의 경력을 쌓고 졸업하기 때문에 위와 같은 종류의 커버레터나 이력서를 작성할 수 있게 되는 것입니 다. The purpose of this letter is to ask for your firm’s consideration for an available position as a Senior Industrial Engineer. I have approximately 15 years’ experience in industrial engineering and manufacturing process engineering with an emphasis on cost and manpower reductions, general floor troubleshooting, automation, equipment justification, and line balancing. After you have reviewed my resume, I would appreciate the opportunity to discuss with you any industrial engineering openings. Thank you for your time. 가장 전통적인 이력서 작성 방식으로, 구직자의 경력(experience)을 중심으로 작성하는 방 식입니다. 따라서 직장 경력이 탄탄한 경우, chronological Resume를 작성하는 것이 좋습 니다. 현재와 동일 계통으로 이직을 원할 경우 사용하면 좋지만 완전히 다른 계통으로 바꾸 는 경우에는 사용하지 않아야 합니다. 구직자의 능력, 업적 등을 이력서 앞부분에 기술하는 형태로, 주로 전직을 하는 경우에 사 용하는 것이 바람직합니다. functional resume의 경우 이전 직장에서 자신이 어떤 일을 했 는지에 대해 자세히 언급하지 않는데, 사실상 이전 경력을 내세우고 싶지 않은 경우 이 유 형을 사용합니다. 원하는 일자리와 관련해 특별한 근무 경험은 없지만, 기존의 경험, 경력 또는 소지하고 있 는 기술, 지식 등이 활용 가능하다고 판단될 때 사용할 수 있습니다. 특히 이전의 직장 경 력이 특출하지 않다거나 공백 기간이 있는 경우, 또한 이직이 잦았던 경우에 사용하면 좋습 니다. 이 유형의 이력서는 앞의 두 유형의 장점만을 혼합한 형태라고 보면 됩니다. 따라서 본인의 능력, 업적 등을 앞부분에 기술하고 뒤에는 이전 직장 경력을 상세하게 기술하기 때문에, 앞의 두 유형보다 길어지는 경우가 많습니다. ☞ 시간도 마찬가지입니다. 작은 단위부터 쓰기 시작하세요. 그리고 Resume나 Cover letter 와 같은 formal한 Business letter에서는 가급적 줄임말을 쓰지 않습니다. Feb ( × ) → February ( ○ ) 물론 “1998. 2 ~ 2003. 3”이라고도 할 수 있습니다만 이는 우리식입니다. ☞ 주어가 나(I)인 것은 너무나 자명하므로 이력서에는 생략합니다. 전공은 major, 부전공은 minor이라고 합니다. Graduated from Daehan University in February 2003. Majored in Business Administration with a minor in English & Literature. ☞ ~ 언어 능통 : Fluency in + 언어 말하고 쓰는데도 능통하다고 어필하고 싶으면 “spoken & written”을 보태면 더욱 좋습니다. 요청하시면 추천서 (혹은 신원보증서, 신원보증인) 제출하겠음. (1) Form 주로 많이 쓰는 보편화 된 Form을 따라야 합니다. (2) Reverse Chronologically 시간 순서는 최근의 사실부터 과거사실로 써야 합니다. (3) Effectively & Economically A4 용지 한 장에 들어 갈 수 있도록 해야 합니다. (5) Grammar & Spelling 문법과 철자는 정확한지 다시 한 번 확인하세요. (6) Clean & Neatly 보기 좋고 깔끔하게 작성하는 것은 기본이에요. (7) Personal Data (개인 정보) Name → Address → Phone → E-mail → Marital Status (결혼 유무) → Gender (성별) 순서로 A4 용지 위쪽 중앙이나, 혹은 위쪽 왼쪽 부분에 순서를 지켜서 정렬하여 써야 합니다. 특히 주의해야 할 사항은 위쪽 중앙에 Resume라는 말을 별도로 써 서는 아니 됩니다. (8) Career Objective – 나의 궁극적인 목표를 적습니다. – 큰 회사, 경험, 배경, 마케팅, 홍보 등이 포함되어 있어야 합니다. – 이력서에는 가급적 문장으로 쓰지 마세요. 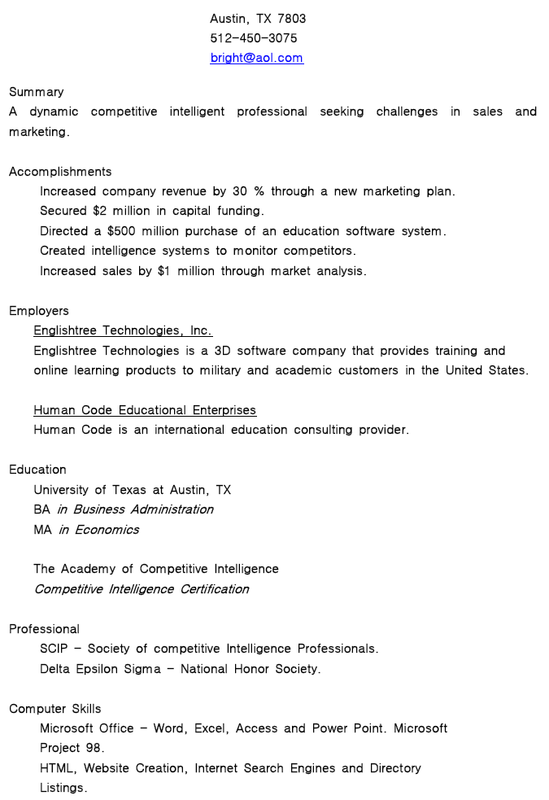 To work for a large company where I can use my experience and background in marketing and promotions. 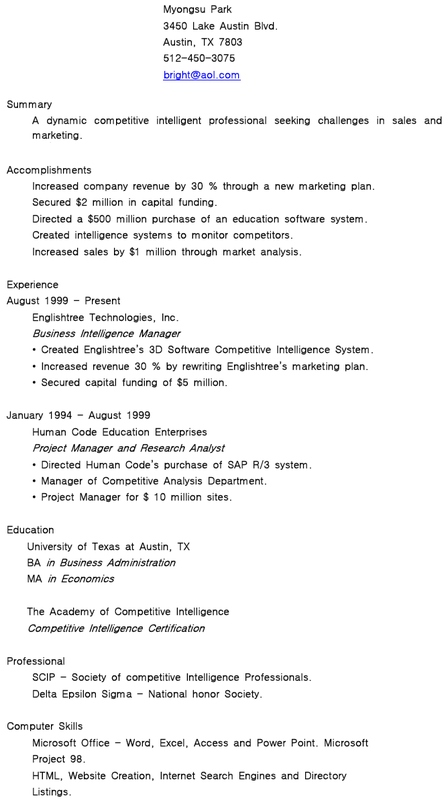 (9) Work Experience (=Employment History) 역 시간 순으로 적으시고, 1999 – Present Diane Rose Company, Marketing and Promotions Specialists – 과장, 부장 자리가 중요한 것이 아니라, 무슨 일을 했느냐가 중요합니다. Supervisor of the consumer marketing and promotions development nine people. (9명 으로 구성된 소비자 마케팅과 홍보 부서의 매니저) 일반적으로 모든 이력서는 경력이 학력보단 위에 있고 경력이 없으면 학력이 우선 그리고 만약 특별한 기술이 많다면 Qualification 이란 항목을 Career Objective 밑에 씁니다. 영문 이력서는 자기가 제일 내세울 수 있는 분야를 Career Objective 밑에 먼저 씁니다. 물론 이 게 정석은 아니지만 대부분의 이력서는 이 룰에 따르게 마련이죠. 그리고 요즘엔 컴퓨터상 에 올려놓는 이력서 종류도 있지만 기본적인 아웃라인은 비슷합니다. 간단하고 알아보기 쉽 게 쓰는 게 면접관들이 중점적으로 보는 분야구요. 그 다음에. 경력이나 학력이 자기들이 가지고 있는 일자리에 적합한가가 그 다음에 보는 것이구요. 거의 인사 담당들이 이력서와 커버레터를 보는데. 1 분에서 3분정도밖에 소요를 안 한답니다. 그러니까. 구구절절하게 너 무 상세하게 쓰면 손해가 난다는 거죠. (10) Education (=Educational Background) – 일과 관련해서 이수한 과목이나 교육 내용을 적습니다. 최근의 것부터 쓰도록 하세요. (예 : 대학 졸업자는 고등학교까지, 대학원 졸업자는 대학교 까지 적습니다.) 모든 이력서(Resume)에는 직장 경력이나 학력은 항상 역으로 작성하는 것 을 잊지 마세요. (Reverse Chronological order) 최근의 학력이 제일 먼저 쓰이고. 최근의 직장 경력이 제일 먼저 쓰입니다. 그리고 되도록이면 간결하고 알아보기 쉽게 쓰는 것이 가장 좋습니다. 대개는 한 장내지 두 장이면 됩니다. 만약 그이상이면 구구절절하게 쓰는 것이 되며, 인사 말은 사람들이 염두에 두지 않게 됩니다. 아 그리고, 특별히 요구되는 것이 아니라면. 중고 등학교의 학력은 안 쓰셔도 됩니다. Completed six specialist courses in public relations and mass communications at the Mass Communication Institute of Korea First University. Experienced at MS Word, Power-point, Excel, and other accounting related software. Honors & Awards (상벌 사항) [option]으로서 필수 사항은 아닙니다. Activities (봉사 활동 등) [option]으로서 필수 사항은 아닙니다. (12) References References available upon request 혹은 Available upon request ※ 마지막으로 Grammar & Spelling 여러 번 확인 하세요. 수 업 목 표 기존의 영어문학 이론 위주에서 벗어나 취업을 위해 반드시 준비해야 할 실무 영어 즉, 사회 현장과 국제 무대에서 활용할 수 있는 영어를 습득하고 활용할 수 있다. – 영문 이력서, 영어 인터뷰, 영어 프레젠테이션, 영어 회의, 전화 영어 등 실제 비지니스에서 반드시 필요한 영어를 습득하고 활용할 수 있다. 영어와 관련된 국가 공인 자격증인 무역사, 국제회의 기획사를 준비하는 학생을 위해서 무역 통상 영어, 국제회의 기획 영어 등도 다루게 되어 실무 영어 습득과 실무 영어 공인 자격증 취득이라는 두마리 토끼를 잡는데 도움이 되도록 습득하고 활용할 수 있다. 수업운영 전략 1) 강의 간혹 기본 실력이 부족한 학생들이 이 과목이 어렵지 않을 까 우려하는 경우가 있는데 절대 그런 느낌이 들지 않도록 재미있고 쉽게 내용을 요약하고 압축된 형태의 핵심 강의를 듣게 된다. 강의 후에는 주어진 학습자료나 교재를 충실히 복습을 해야 한다. 2) 토론 강의 주제와 본인의 경험을 바탕으로 한 과제를 학기당 3편 정도 제출하게 하고 제출된 과제에 대한 심층 이해 및 토론 등을 통해서 지적 경험을 공유한다. 3) 피드 백 공유된 지적 경험에 대하여 십 수 년 간 강의하면서 얻은 나만의 노하우를 바탕으로 학생 여러분들의 실용 영어 활용에 결정적 도움이 되도록 근거를 제시 한다. 4)수업 방법 강의 계획서에 의해 공지된 주 차시별 단위 주제에 대하여 Eesume, Cover & Self Introduction Letter, Interview English, Business Presentations, Business Meetings, Business Travels, Business Calls 순으로 동영상 강의하고 핵심 부분은 판서 암독 및 실지 연습을 하게 하며 필요에 따라 Video, Audio, 등의 보조 교구를 활용하여 Cyber 강의 특성에 맞추어 진행한다. 특히 학생의 요구에 따라 성원이 되면 경희대 강의실 오프 특강 수업도 진행한다. 출석(20 %), + 중간(30 %) + 기말(30 %) + 기타(10 %) + Q & A 게시글 수(10 %) = 총점 100 점으로 환산하는 [상대평가]이다. 전체 점수 중 60%의 비율을 차지한다. 시험은 객관식 선다형으로 출제하며, 중간고사는 과제물로 대체 할 수도 있다. 중간 고사를 과제물로 대체할 시에, 과제물은 A4 용지 5매 이내로 작성하여 제출하며 과제 Topic은 영어 이력서, 혹은 영어 자기소개서 등 여러분들이 한번쯤 작성해 보아야 하는 실용적이고 유익한 과제 내용을 본인의 상황에 맞추어 작성하게 된다. 3) Q & A 및 기타 학습 활동(진도) 전체 점수 중 20%의 비중을 차지한다. 수업 중 학습태도로서 학교 게시판이나 Q & A 등 Cyber학습 활동의 활발한 참여도와 성의도를 반영할 것이며 게시판을 통한 학습 주제와 관련된 학습 상호의견 교류 및 Q & A 글의 갯수와 내용의 질에 따라 상/중/하로 구분된다. 3 박 명섭(2004), 영문 비즈니스 레터 & E-메일 작성법. 4 박 명섭(2004), 영문 비즈니스 레터 & E-메일 작성법. 5주차 Chapter 05. Preparing for a Presentation. 7주차 Chapter 07. Meeting English for Job Business. 9주차 Chapter 08. Brainstormong for a Meeting. (미팅 브레인스토밍 하기) Lecture 01. Brainstorming Meetings. (브레인스터밀 미팅) Lecture 02. Evaluating Suggestions. (제안 평가하기) Lecture 03. Providing Feedback. 12주차 Chapter 11. Getting Around in the United States. 14주차 Chapter 13 : Messages, Voice Mail, Requests, and Questions. (메시지, 음성 메시지, 요청,질문하기) Lecture 01. Leaving a Message.